I am really excited about the developments in the green beauty industry lately. Years back you couldn’t find many truly organic products on the high street but now times are changing and shops, including supermarkets, have started to focus more on ever growing natural and organic market. One of the brands which you will now be able to purchase easily is Danish organic beauty specialist, Urtekram (the name translates to ‘herbal-hug’). In Tesco, you are now able to find a range of Urtekram haircare products, including their conditioners. Urtekram has been founded in 1972 and is renowned for creating plant-based products which are wholesome and natural. In their extensive range of products you will not only find shampoos and conditioners but also body lotions, shower gels, hand creams and much more. Urtekram products are cruelty-free, certified by Ecocert and are Vegan Society approved. What’s more, these products are really affordable with prices starting from as low as £1.75. Urtekram Aloe Vera Shampoo was one of my favourite shampoos from the collection. Although it says on the packaging that it’s suitable for normal hair, I found it great on my fine hair which gets greasy really quickly. The combination of aloe vera shampoo and conditioner didn’t weigh my hair down and my hair didn’t get greasy any quicker. The aloe vera shampoo foams well and the Aloe Vera Conditioner detangles hair well but not as good as Faith in Nature conditioners do. I would give it 7 out of 10 for detangling. After use, my hair feels smooth and soft, manageable. My ends are still on the dry side but that’s just normal. Aloe Vera is well known for its soothing and regenerating properties so I think the shampoo would be great for the itchy and dry scalp as well. Aloe vera is also moisturising and shampoo also has an addition of glycerine for that extra care. The scent of Urtekram Coconut Shampoo is not that ‘coconutty’, it’s not that kind of smell you find in the usual coconut products. Perhaps that’s because this shampoo contains coconut nectar, not the coconut oil/butter. 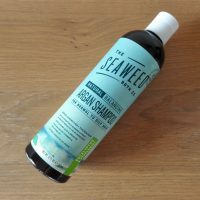 The shampoo is suitable for normal hair but it’s intended to moisturise hair and at the same time to revitalize it with an addition of seaweed extract. I found Urtekram Coconut Shampoo quite runny but it foamed well. I would prefer it if it was less runny though. The Coconut Conditioner is less runny than the shampoo and it has a similar detangling effect to the aloe vera conditioner. 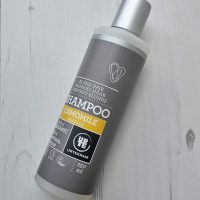 Although the shampoo and conditioner have ingredients to nourish hair, my hair didn’t feel weighed down and didn’t get greasy any sooner which I was worried about. Urtekram Rose Shampoo is thicker than the coconut shampoo and the texture feels more gel-like. It cleans my hair well. You can just smell the rose in the shampoo, it’s not very strong. Rose geranium oil is known for its calming and very nourishing properties and the rose shampoo is suitable for normal hair. 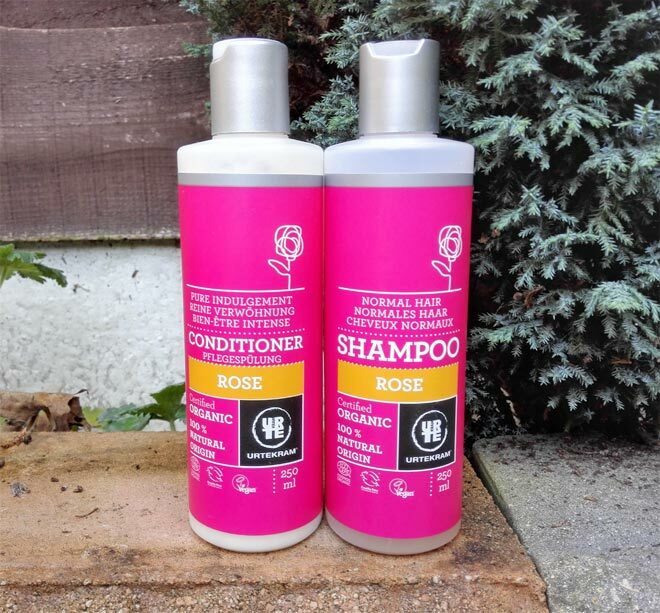 I found a combination of Urtekram Rose Shampoo and Rose Conditioner a little bit heavy on my hair – my hair got greasy sooner than after using the Aloe Vera range. But I think that’s because of the conditioner, not the shampoo. I concluded that I may be using too much conditioner on my hair so it’s better to use less if you don’t want your hair to feel weighed down. It’s also important to rinse it really well to avoid any residue. Urtekram Nordic Birch shampoo is thicker than the rose or coconut shampoo. I found the scent quite nice, better than scents from other shampoos. It seems that this scent comes from corn flowers. An addition of birch leaf extract in both, shampoo and conditioner, is intended to strengthen hair. 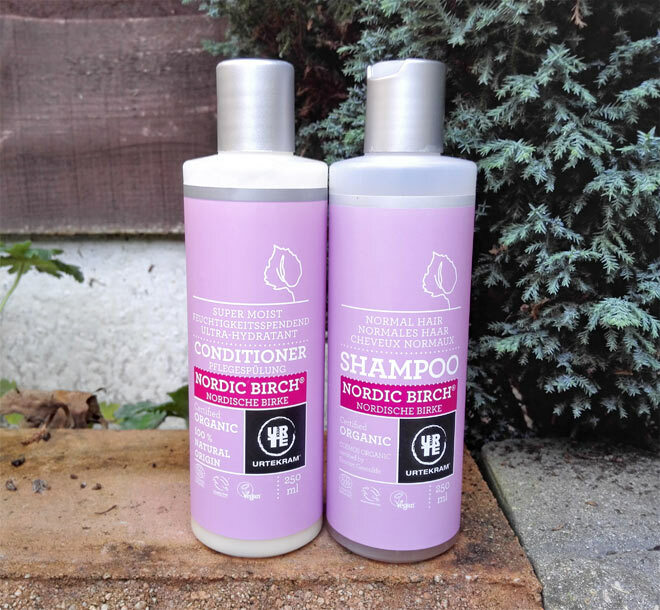 Urtekram Nordic Birch Shampoo and Conditioner are quite nourishing to the hair so I think they are more suitable for dry hair or just ‘normal hair’. Nordic Birch Conditioner is ‘super moisturising’, it says on the label, and that’s due to ingredients such as aloe vera, lecithin and glycerine. Comparing to the other Urtekram shampoos & conditioners, my hair did feel different after using the Nordic Birch range. It felt slightly softer but unfortunately, my hair got greasy sooner so I wouldn’t recommend it to people with hair like mine (fine, gets greasy quickly). I think Nordic Birch Shampoo would be great for dry and frizzy hair and normal hair which needs a bit of TLC after a holiday period. Urtekram No Perfume range has been approved by Danish Asthma & Allergy association and can be safely used on children. Urtekram No Perfume Shampoo & Conditioner are suitable for normal hair and are enriched with glycerine and aloe vera extract which both moisturise the hair. Although No Perfume Shampoo & Conditioner don’t contain any essential oils, they still have this distinctive smell which is hard to describe. I cannot associate it with any natural ingredients but I am wondering if it’s aloe vera extract which is a third ingredient on the list? Or is it sodium coco sulfate which is responsible for the foaming action? I just don’t know. Anyhow, if you have sensitive skin, suffer from allergies or you want to add your own scent to your haircare products, the Urtekram No Perfume range is worth considering. I found it ok, nothing stood out too much for me. 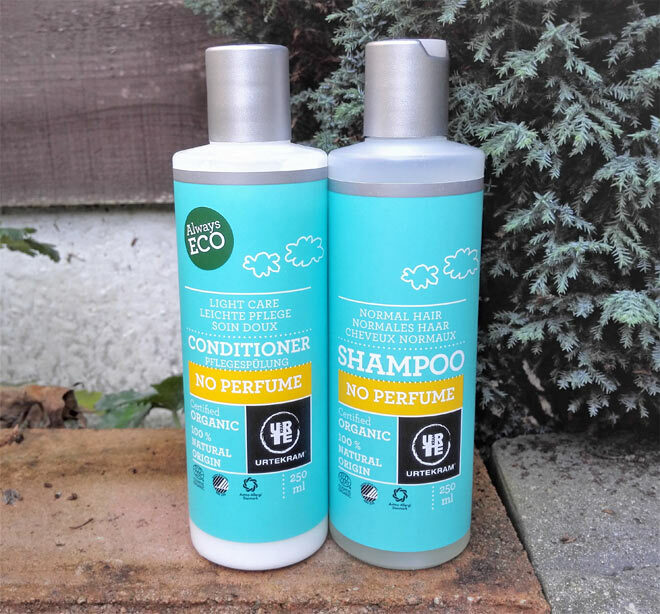 Having tried all five Urtekram shampoos & conditioners which you can now find in Tesco, I can now say that my favourite scent is definitely the Nordic Birch but unfortunately, this range is a little bit too nourishing for my fine hair. It would be great for dry hair though or hair which needs a little bit of TLC. Saying that, the Nordic Birch range makes my hair feel the most amazing – really soft and smooth with ends feeling less dry. In terms of scent I found Aloe Vera and Rose shampoos great, not the most amazing scents, but alright. To be honest, the scent is the least important for me as I always look for hair care products which wouldn’t weigh my hair down. It already gets greasy pretty quickly as it is so I don’t want to make it worse by using the wrong products. 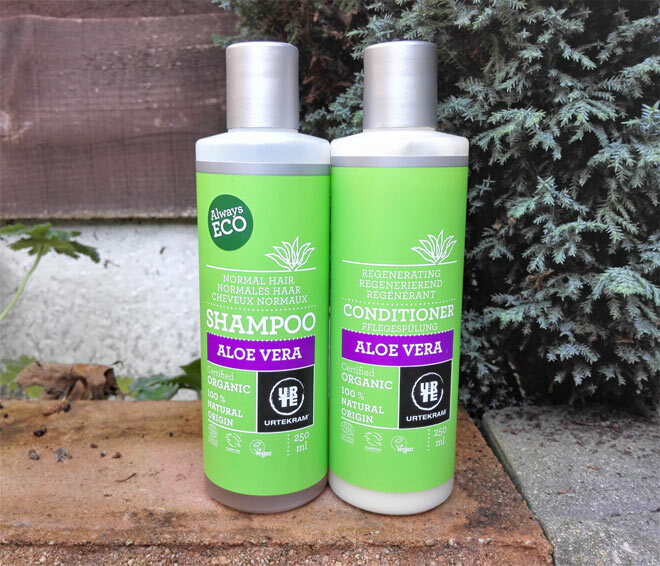 It’s difficult to choose my favourites from the whole collection but I certainly got on with Aloe Vera Shampoo & Conditioner and No Perfume Shampoo & Conditioner. 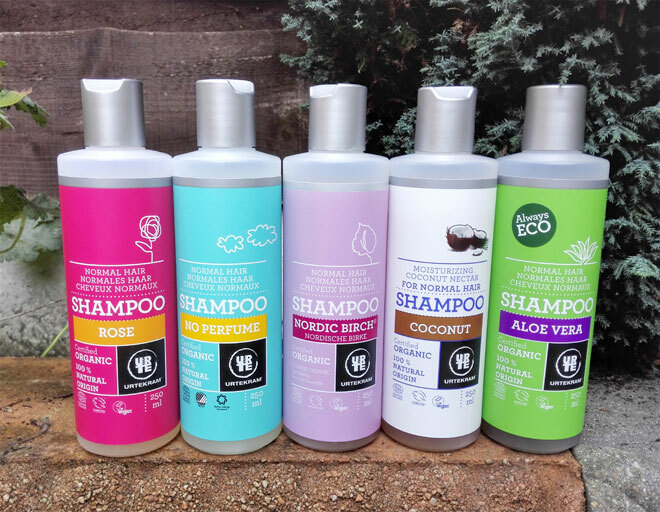 Overall, Urtekram organic shampoos & conditioners are not bad at all – they are certified organic with 100% natural origin, they foam well and leave the hair feeling squeaky clean. The added bonus is that they are also vegan and cruelty-free and what’s more important, they are affordably priced at £6.00 and you can find them in Tesco (and also in Ocado). Have you heard of Urtekram before and have you tried any of their products yet? * This is a collaborative post, all opinions are my own.